Spring is the perfect time to redesign your home’s scenery for summer. Trimming, planting and a whole lot of sweating can go into landscaping but will have a large payoff. Here are a few helpful tips to lead you from ordinary yard to eye-catching curb appeal. 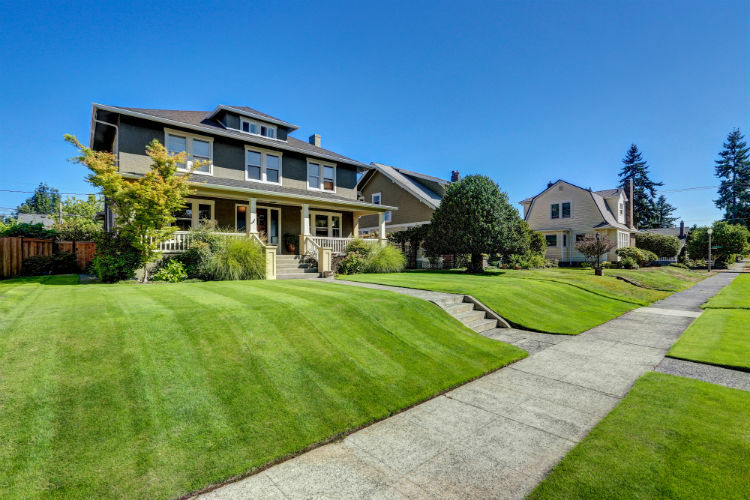 One important tip to having a visually pleasing front yard is the proper grass height. When a lawn is cut too short it will dry out, leading to weed growth. This can also make your lawn vulnerable to diseases and pest invasion. A good tip is never to cut more than one-third of the grass blades off at once, meaning you need to mow a little more frequently. However, this will lead to a much healthier lawn. It is important to keep in mind that different grass types deserve different attention. To find the best cut for your lawn, check out “What Is the Ideal Height to Cut the Grass?” article by DIY Network. Edging your garden can create shapes and boundaries that define the area aesthetically. Without a proper edge, your lawn can eventually invade your garden leading to greater weed growth. Using plastic or steel edging, you can quickly and easily implement a divider between the two. The barrier also adds an accent piece to your curb appeal and adds a subtle touch needed to define your garden. Spring is a perfect time to work on your lawn. With a few quick fixes to your lawn maintenance routine, you can enhance your home’s landscape. While the home exterior is a big part of your curb appeal, be sure to contact Sunset Ridge Exteriors at (608) 838-2500 for any exterior renovations and repairs on your home.